Cells fluoresce when the GFP gene is expressed, indicating that the regulatory elements of gene A are turned on. Expression of a reporter gene can be readily detected, making it useful in the study of gene regulation. encodes a readily observable phenotype such as fluorescence, making it possible to directly observe the expression of the gene. This, in turn, makes it possible to determine the conditions that affect gene activity. 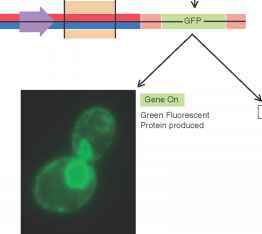 One widely used reporter gene encodes a protein called green fluorescent protein (GFP). Yeast can be genetically engineered to serve many of the functions described for bacteria. They serve as an important model for gene function and regulation in eukaryotic cells. ■ Pest-resistant plants Corn, cotton, and potatoes have been engineered to produce a biological insecticide, a protein crystal called Bt-toxin (figure 9.5). This toxin is naturally produced by the bacterium Bacillus thuringiensis as it forms endospores. 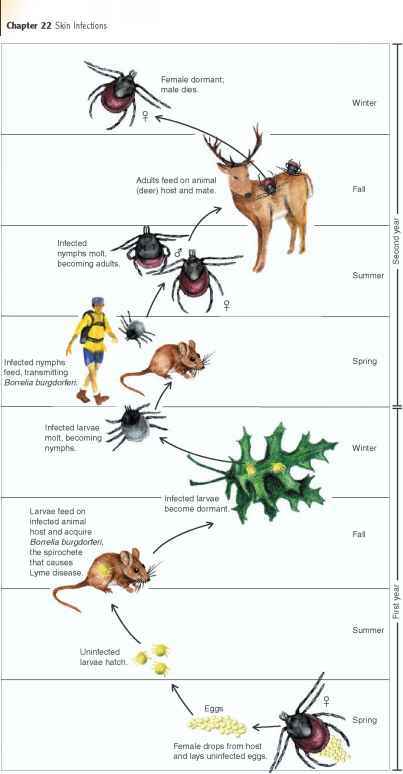 The toxin binds to specific receptors in the insect gut, causing the gut to dissolve. Unlike many chemically synthesized toxins, Bt-toxin is toxic only to insects, including their larvae. Crystal/spore preparations have been applied to a variety of plants around the world for over 30 years without any apparent harm to the environment. 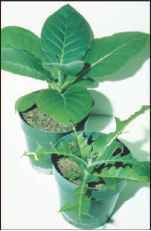 Figure 9.5 Pest-Resistant Transgenic Plant The plant in back has been genetically engineered to produce Bt-toxin.The control plant in front has been ravaged by pests. biodegradable, in place of more persistent alternatives. Also, because the herbicide can be applied throughout the growing season, the soil can be tilled less frequently, preventing erosion. ■ Plants with improved nutrient value Researchers around the world are attempting to employ genetic engineering to improve the nutritional value of plants that are used as food. A recent example is the introduction of the genes that code for the synthesis of b-carotene, a precursor of vitamin A, into a variety of rice. The rice was also engineered to provide more dietary iron. Since the diet of a significant proportion of the world's population is deficient in these essential nutrients, advances such as this could have a profound impact on world health. ■ Plants that function as edible vaccines Bananas or other foods could someday be used as vehicles for edible vaccines. Researchers have successfully genetically engineered potatoes to produce certain proteins from disease-causing microbes and have shown that the immune system responds to these proteins, raising hopes for the development of an edible vaccine. Whether the immune response is strong enough to protect against the actual disease-causing microbe remains to be determined.